Reflecting on the past week …. … we then flew down to Cape Town … (actually we flew SAA but couldn’t resist taking a photo of this Kulula plane taxiing down the runway – all their planes have funky paintwork and advertising) …. Soothing sounds of a harp wafted around the foyer of the hotel …. 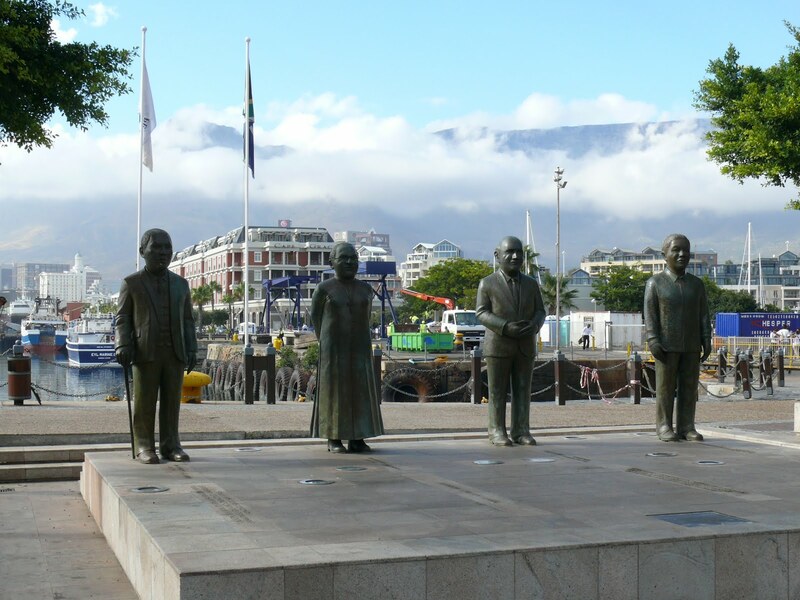 .. which is not far from the V&A Waterfront … our hotel is just off the photo to the right ..
.. and where the statues of Nobel Peace Prize Winners … from left to right … Chief Albert Luthuli, Archbishop Desmond Tutu, Mr F.W. de Klerk, and Mr Nelson Mandela …. stand proud ..
… anyone for ice cream ? …. quick .. it’s melting in the heat !!! 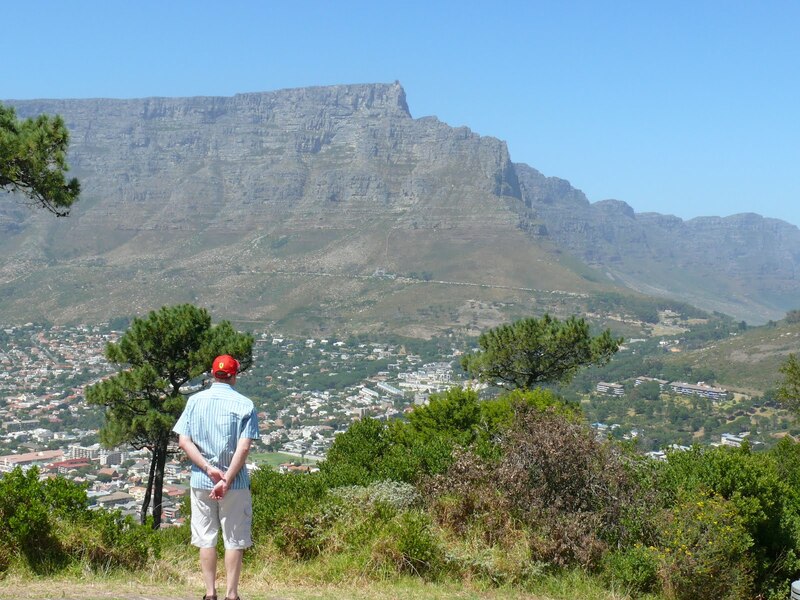 Whilst hubby was at the conference, I spent some family time in Somerset West …. .. anyway .. while she went to beading .. I spent some time with my Mum. She is looking well although very thin. She knew me. Always breaks my heart when I say goodbye … she may not know me next time ..
… and an intriguing box on the mantel … !!! Not a moment to waste … wine tasting at Asara … mm .. mmm !!! all excellent wines !! 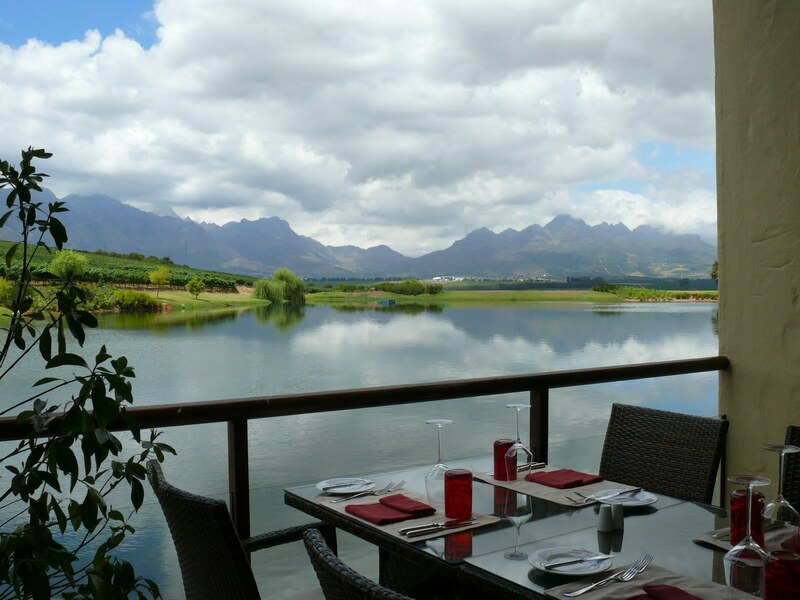 … and delicious Tapas with more family … oh yummy .. yes .. very yummmm ..
… overlooking the lake and Stellenbosch Mountains … (I’ve been there before with Ian and Kathy and taken photos .. so if it looks familiar to some bloggers .. it is !!!) 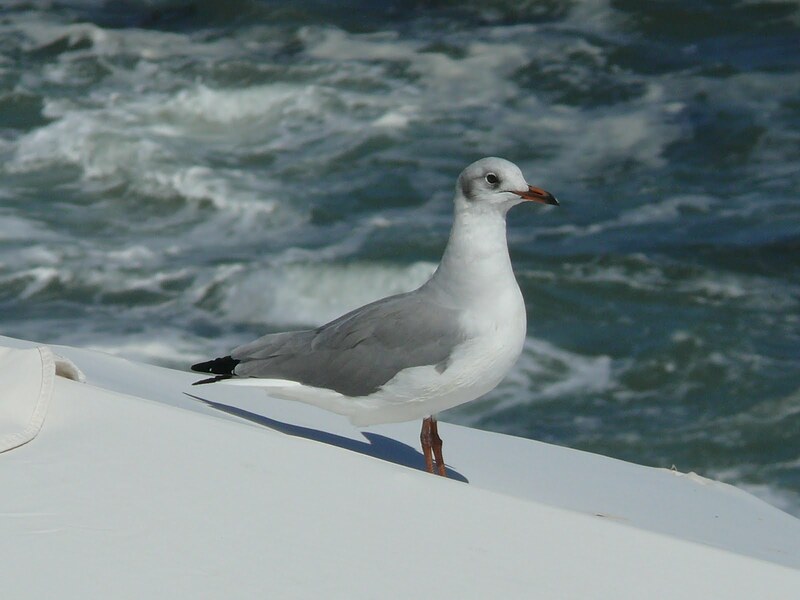 But just had to share it with hubby, Cheryl and Bob (who had not been there yet) ..
.. and a seagull .. Au revoir … ’til we meet again ..
… on Saturday was Connor’s 3rd birthday party …. 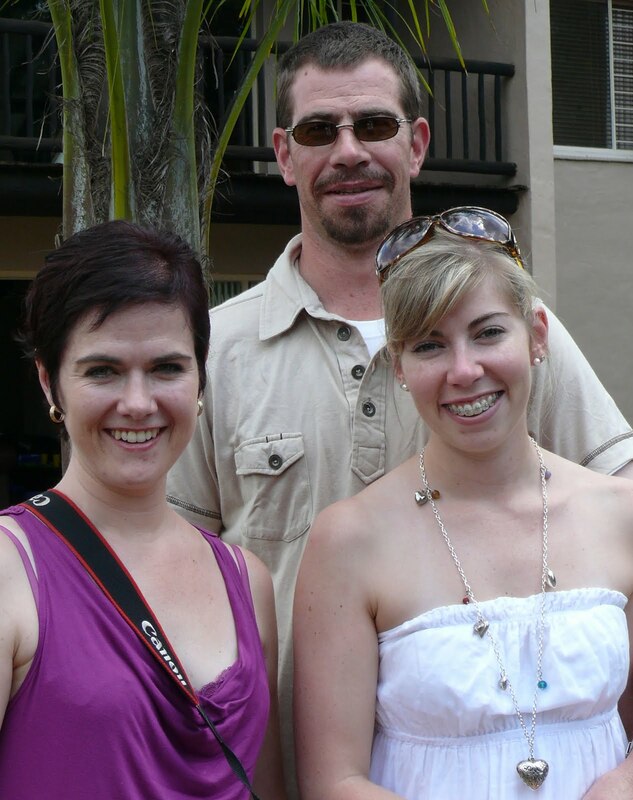 and all our three children were there … in the same spot …. at the same time …. we all live here .. but it’s very rare that they are altogether at the same time …. photo opportunity !!!! Fun waterslide for all the littlies … and some biggies!!! Jeanette has more photos … check them out … they are far nicer than mine could ever be … !!! Ai, I miss Cape Town. Its been a while since my last visit. I need to get an excuse to go. OH those tapas look yummy! You saved the best for last!!! 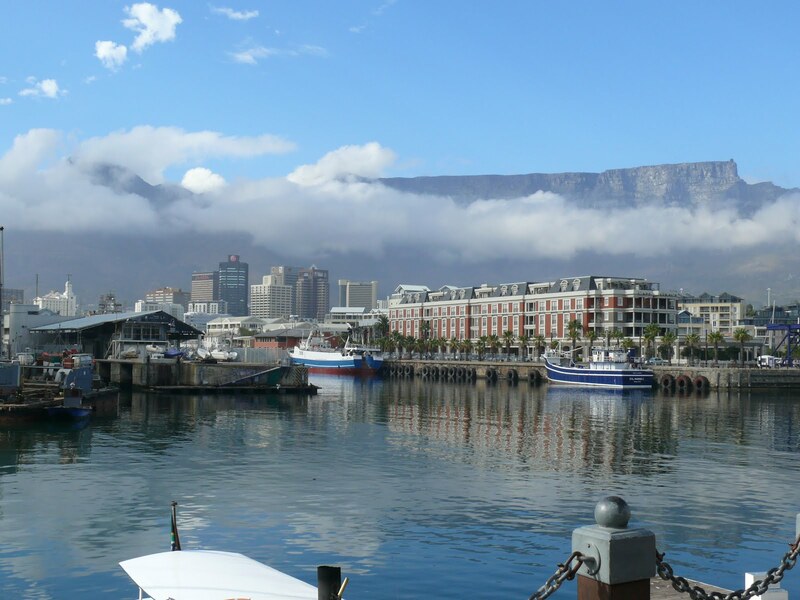 Loved this post, some of the photos of the Table Mountain almost looked like paintings with that dramatic cloudy sky. I'm glad you had a good time and got to spend some time with Mom.